PARIS (AFP) ― A comfortable, middle-class Parisian life may be the envy of many people, but Florence Porcel would give it all up to be among the first Earthlings to settle on Mars ― even with no option of return. “I have always felt a bit cramped on Earth,” the self-confessed space junkie told AFP, delighted to be shortlisted with some 1,000 other aspiring voyagers for Mars One ― a private project to colonize the Red Planet from 2024. “I have always dreamt of exploring other worlds,” the 30-year-old journalist said. Porcel is among about 200,000 people from around the world who volunteered for the extraordinary project. It would see two dozen pioneers abandon Earth for a new start on a cold, dry, oxygen-less planet some 55 million kilometers (6 months’ travel) away. The high cost of the project, an estimated 6 billion dollars, precludes the option of a return trip. The trial resettlement is meant to be mainly funded by a reality-TV show about the project. The final 24 would be sent to the Red Planet in six separate launches starting in 10 years, according to the Dutch-based non-profit group behind the endeavour. A short-listed 1,058 candidates from 140 countries were informed on Dec. 30 they had made the first cut after going through an online vetting process that included an extensive questionnaire. The criteria, according to Mars One, include an “indomitable spirit,” “good judgement,” and “a good sense of play.” The interplanetary pioneers must also be disease- and drug-free and English-speaking. The list will be finalized next year after further medical and psychological tests. Many experts scoff at the project’s feasibility, questioning whether the participants would survive the physical perils and demands on their sanity. Porcel said she was under no illusions about the challenge. “We will be trying to survive on a hostile planet: even breathing, drinking and eating won’t be a given. We will need a lot of hard work, energy and expertize ... also some luck!” she said, sitting on the couch in her small apartment near Paris. A world away from the life that awaits the pioneers ― growing their own food in air-locked pods protecting them from Mars’ thin, unbreathable atmosphere and sub-zero temperatures, the decor in Porcel’s apartment is cosy and girly ― a cherry-red carpet and heart-shaped mirror adorn the lounge. But her life’s passion is evident from the heavy sprinkling of space paraphernalia in-between ― a hanging mobile of the Solar System, photos of the journalist floating in a zero gravity experimental flight, and a large collection of books on astrophysics. “I would really love to help find answers to some of Mankind’s existential questions: ‘Who are we?,’ ‘Why are we alive?,’ ‘Why are we on Earth?’ and ‘How was the Solar System born?’,” she said. “I am part of a generation that hasn’t seen a human set foot on a celestial body other than Earth,” since the end of the Moon missions in 1972. “If Mars One gives me the chance, I will do it! It will be a first for mankind!” Porcel said, adding she had no plans to settle down or have children. 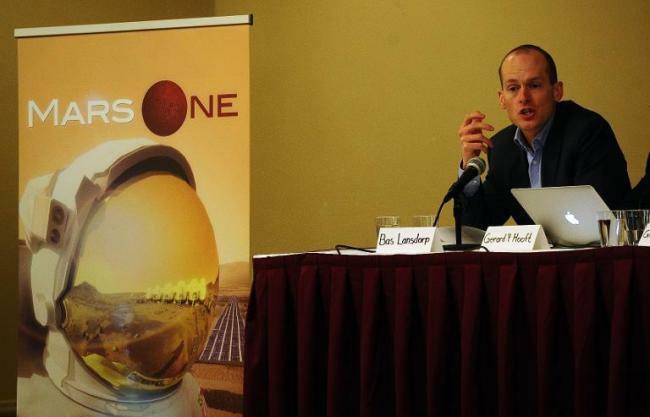 Mars One counts a Dutch 1999 Nobel Physics winner, Gerard ‘t Hooft, among its supporters. But there are skeptics, too. “For now, I am ready to see this through. If I make it to the final 24 and find myself on the launch pad ... perhaps it will be different ... ” said Porcel.